In 1969, Tom McEwen campaigned the Barracuda funny car that previously belonged to Candies & Hughes. 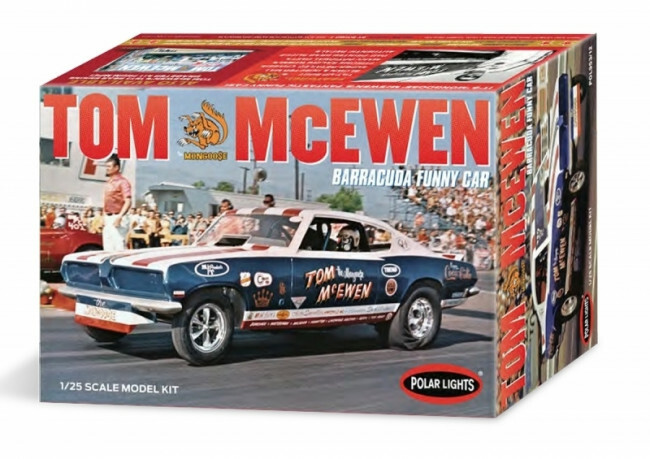 With an all new paint job and McEwen’s piloting skills, this racer was a memorable player in the history of early funny cars! Polar Lights’ kit features all-new decals, painstakingly created for authenticity, accuracy and fit. Pad printed M&H Racemaster drag slicks sweeten the deal. Outstanding packaging with multiple photos of the car offer modellers plenty of reference material!